It’s not only possible but it’s also very easy to go to Bordeaux and back in a day from London. 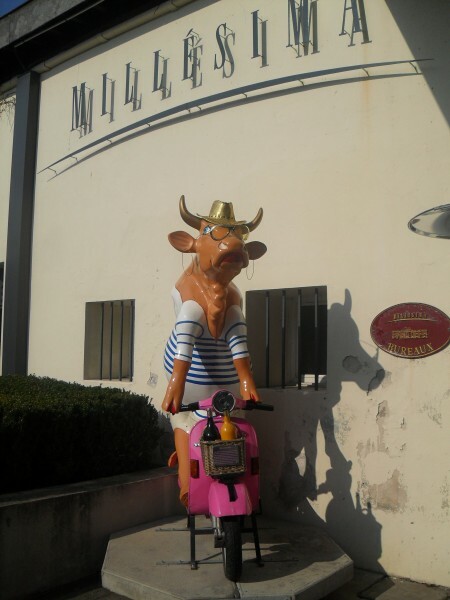 I’m talking from personal experience as I recently flew down for the day for Millésima’s annual Panorama Tasting. 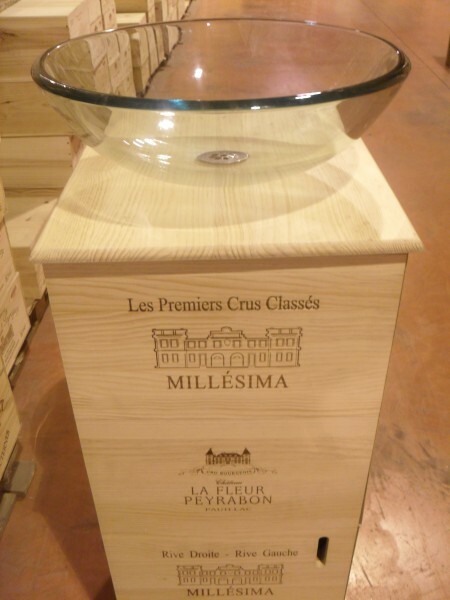 Millésima is one of the biggest negociants in Bordeux, handling many top cru classes of Bordeaux, such as Ch. Palmer, Ch. Lynch-Bage, and Ch. Leoville-Barton to name a few. 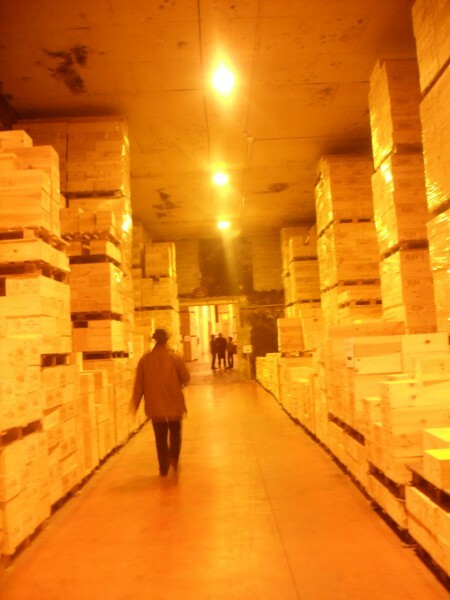 The tasting was held in Millesima’s 200 year old cellar amongst cases and cases of grand cru, premier cru and other wines,they say they have over 2.5 million bottles of fine Bordeaux resting in their cave. I spied older vintages of Chateau Margaux, Cheval Blanc and Chateau Palmer piled high and waiting patiently. I would have loved to be let loose in there for a few hours with a corkscrew. The tasting was to showcase the 2009 vintage which is just now being released.What I found most interesting was that they had grouped the wines by appellation, all the St. Juliens together, all the Pauillacs together etc. It made for a not only comprehensive tasting but also made it very easy to distinguish the styles and terroir of each particular area. Pauillac for me was the stand out, well balanced wines with plenty of structure, definitely built to last and quite savoury, intense fruit on the nose, spice on the palate, leather but very approachable now in a few years will definitely mature into beautiful wines,rich ripe, velvety tannins very evident, sweet fruit noses – Ch. Hauts Bages-Liberal was the standout in that it had a rather funky nose, almost bretty, found this in a few other Pauillacs, which I like, very savoury, not much fruit but still complex leather, aniseed, tobacco, cedar notes, great structure, wines to savour. Such an interesting tasting, afterwards we had Bollinger to cleanse the palate, the chairman found out that Millésima was doing a grand tasting and graciously donated his champagne. 30 journalists and 12 bloggers present amongst the throng. 119 wines on show, I didn’t try them all but many of them. I was a rather informal way to taste the wines, scattered around the cave of Millésima but I think I enjoyed tasting on my own and discovering each wine as I went along, abandoning ones I found uninteresting and moving on to other wines or even other parts of Bordeaux all within a few feet. Those were the highlights for me. My notes are hardly complete but those were my impressions as I winged my way back to London later that evening, rushing to get back to an early preview of 2010 Bordeaux in Soho at a winemakers dinner. Post to follow soon, I’m sure. “It’s not only possible but it’s also very easy to go to Bordeaux and back in a day from London. ” How did you do it (as in, what airports and means of transport)? Would be an interesting thing to try one day. And how much did it cost you? Gatwick-Bordeaux direct, £100 r/t with BA (although Millesima picked up the tab, that was the price on the receipt). It was an early morning. I caught the 7am out of Gatwick which means I had to leave home at 4:30! Maybe not sooo easy but very doable. You can catch the 18:20 back to London, would have been perfect if the plane hadn’t been delayed over an hour coming back to London.